It’s not just the body panels that have been replaced. In fact, the only parts retained from the original motorcycle are the chassis and engine. Every other part was sourced from the YZF-R1M. At the front, the modified motorcycle features twin projector headlights with LED DRL, along with an air intake in the centre and a tinted windscreen on the top. The rest of the fairing, fuel tank and the rear panels were also replaced with units from the YZF-R1M. Once the body panels and hardware were installed, the YZF-R15 V3.0 was sent to a sticker shop to copy the paint theme of the YZF-R1M. The kit includes silver body panels along with carbon fibre texture and blue stripes. The pillion seat and footrests were removed from the motorcycle to give it a track-ready look. The pillion saddle was replaced by a sporty cowl. 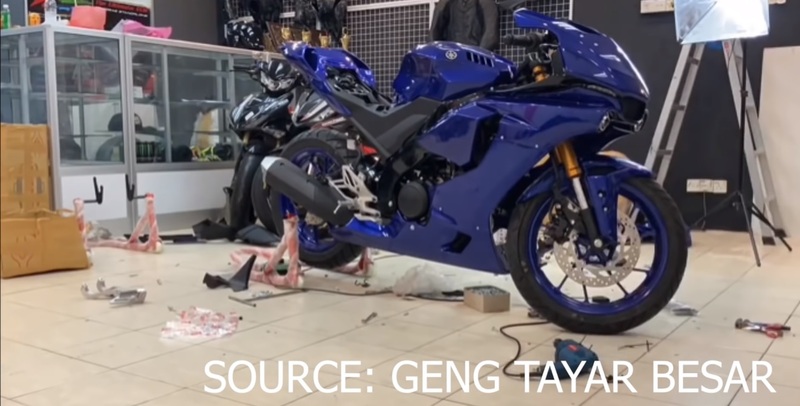 The swingarm also has been borrowed from the YZF-R1M. The jaw-dropping upgrade does not stop there. The 155 cc motorcycle boasts an Akrapovic exhaust system to provide it with a complete look. The suspension and braking setup was also replaced. The modified YZF-R15 V3.0 is equipped with Ohlins sourced shock absorbers. The international-spec model already gets upside-down forks, but the modified motorcycle benefits from even beefier units, from the premium suspension manufacturer. The braking department now includes twin disc brakes at the front that would be more effective than the already impressive setup from the standard motorcycle. The new alloy wheels are shod with soft compound tyres to achieve the litre-class motorcycle’s look. The comprehensive transformation includes YZF-R1M-spec suspension, brakes and swingarm. The only parts retained from the YZF-R15 V3.0 are the chassis and the engine. Updates to the mechanical specifications were not mentioned, but we are sure the Akrapovic exhaust would have delivered a marginal bump in numbers. For reference, the standard motorcycle draws 19.3 PS of maximum power at 10,000 rpm and 14.7 Nm of peak torque at 8,500 rpm from its 155 cc single-cylinder liquid-cooled, 4-stroke, SOHC, 4-valve, fuel-injected engine.